Despite the “model minority” image of Asians and that their general health has been perceived as better than other racial groups, numerous health disparity concerns and clinical knowledge gaps exist that are unique to this group. The leading causes of death in Asians include cancer, heart disease, stroke and diabetes. Asians experience a higher rate of certain cancers. In addition, diabetes and kidney diseases are significantly higher in certain Asian sub-groups (Filipinos, Vietnamese, and South Asians) than the general population. California has the largest Asian population in the nation. 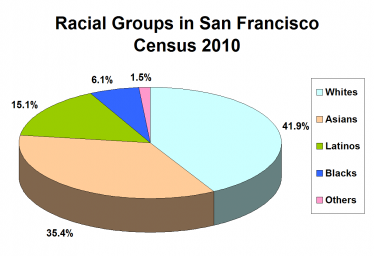 In San Francisco, 35 percent of the population is Asian, with approximately 32 percent of these Asians being 55 years and older (disproportionately larger than 26 percent of the general population). Only about 17 percent of this group is estimated to "speak English very well", with 50 percent estimated to "speak Chinese at home" and 33 percent estimated to "speak English less than very well." Language and communication limitations have been identified as significant barriers to access to health care for those with limited English proficiency. It is imperative that we recognize “Asians” as an all-encompassing term to represent a diverse group of both immigrants and American-born Asians, with 50-to-60 percent of the immigrants coming from 24 Asian countries, and speaking over 100 different Asian languages or dialects. Each Asian sub-group has its unique physical characteristics, genetic make-up, and cultural habit, and there can be even finer differentiation within each of these subgroups that may affect their overall health and health care outcomes. Hence, health care providers face huge, additional challenges and issues in their efforts to optimize the health and health care of their Asian patients.